A new book published this week champions two Polish towns as being among the most beautiful in the world. Italian authors Gianni Biondillo and Paolo Paci single out the south-eastern settlements of Sandomierz and Kazimierz Dolny (pictured) as amongst their personal favourites. The Most Beautiful Corners of the World (Najpiekniejsze zakatki swiata), as the book is entitled, celebrates eighty small towns where the spirits of the old world endure. As the authors highlight, in 1900, only 14 percent of the world's population lived in cities. Today, some 51 percent do so, and in twenty years time, the number is expected to cross the 60 percent mark. Besides the pair of Polish towns, the Italian authors chose such treasures as their native San Gimignano, in Tuscany, as well as France's Saint-Paul-de-Vence, Holland's Enkhuizen, Germany's Fritzlar, Ballycastle in Northern Ireland and the Czech Republic's Kutna Hora. 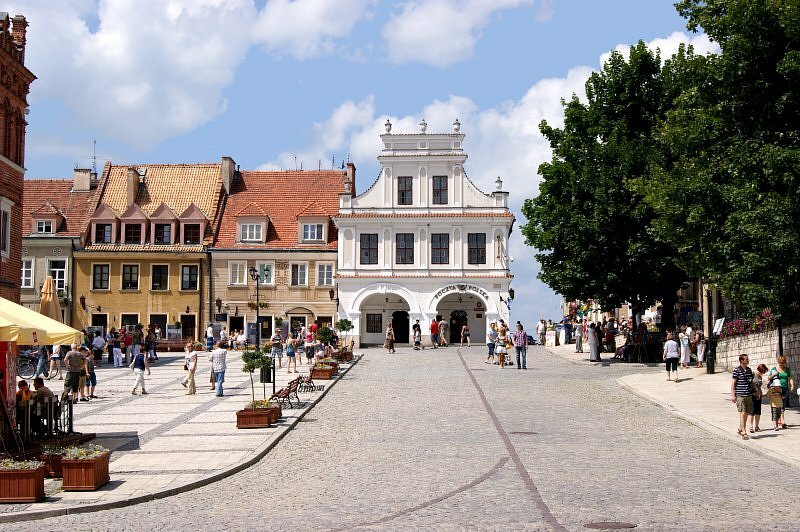 The authors note that tourism is helping these towns to flourish, as has indeed been the case with Sandomierz and Kazimierz Dolny. 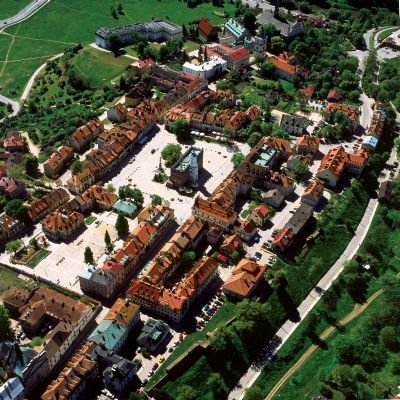 The striking hilltop settlement of Sandomierz was first mentioned in Polish chronicles during the early 12th century. Rebuilt in the 14th century after it was burnt down by invaders, the new lay-out has survived almost unchanged until today. Kazimierz Dolny, located on the River Vistula, was a key player in the grain trade that made Poland so wealthy during the 16th century. The richly ornamented merchants houses continue to charm visitors until today. Sandomierz (pronounced: [sanˈdɔmjɛʂ] ( listen)) (German: Sandomir; Latin: Sandomiria ; Yiddish: Tsuzmir ; Russian: Сандомир ; Czech: Sandomìø) is a city in south-eastern Poland with 25,714 inhabitants (2006). Situated in the ¦wiêtokrzyskie Voivodeship (since 1999), previously in Tarnobrzeg Voivodeship (1975–1998). It is the capital of Sandomierz County (since 1999). 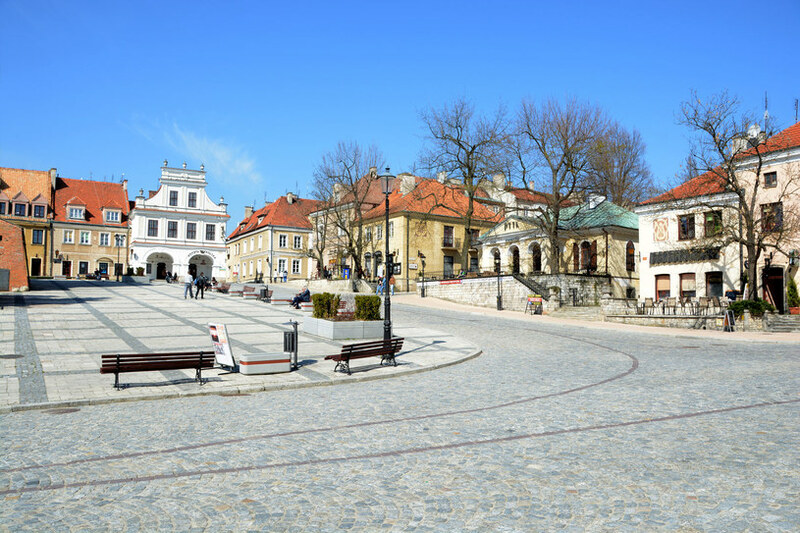 Sandomierz is known for its Old Town, a major tourist attraction. Administrative borders directly Tarnobrzeg. The name of the city comes from Old Polish Sêdomir, composed of Sêdzi- (from the verb s±dziæ "to judge") and mir ("peace"). Sandomierz is one of the oldest and historically most significant cities in Poland. Archeological finds around the city indicate that humans inhabited the area since neolithic times. The city came into existence in the early Middle Ages, taking advantage of an excellent location at the junction of Vistula and San rivers, and on the path of important trade routes. The first known historical mention of the city comes from the early 12th century, when the chronicler Gallus Anonymus ranked it together with Kraków and Wroc³aw as one of the main cities of Poland. In the testament of Boles³aw Krzywousty, in which he divided Poland among his sons, Sandomierz was designated as a capital of one of the resulting principalities. In the course of the 13th century the city suffered grievous damage during raids by Tatars in 1241, 1259 and 1287. The old wooden buildings of the town were completely destroyed. As a result, in 1286 the city was effectively refounded by Leszek Czarny, under Magdeburg Law. The founding document is still preserved in the city archives. An important note, in 1260, as the Tartars invaded Christian Sandomir, a community of Dominicans was praying Matins while a novice read the martyrology for the next day: “the 49 martyrs of Sandomir”. When the friars realized they were being warned of their death, they spent the remainder of the night and all the next day preparing to meet the Lord. At last, after the brethren had finished praying Compline, and as they processed singing the 'Salve Regina' to Mary, the Tartars broke through the church door. While the Tartars intended to bring death to these Dominicans, they actually brought them great gifts - crowns of martyrdom. Ever since, at the death of every Dominican a song to his Beloved Mother is sung to usher him into her arm - the 'Salve Regina' (or 'Hail, Holy Queen'). After Polish lands were reunified in the 14th century, the former principality became the Sandomierz Voivodeship, incorporating large areas of southeastern Poland. At this time Sandomierz had about 3000 inhabitants and was one of the larger Polish cities. In the middle of the 14th century the city was burned again during a raid by the Lithuanians. It was rebuilt during the rule of king Casimir III of Poland. The layout of the city has survived practically unchanged since that time until the present day. The following three hundred years, running until the middle of the 17th century, were quite prosperous for the city. The most important historical buildings were built during this period. This golden age came to an end in 1655 when Swedish forces captured the city in the course of the Deluge. After briefly holding out in the city, the withdrawing Swedes blew up the castle and caused heavy damage to other buildings. In the next 100 years the economy of Poland suffered a decline, which also affected the city. A great fire in 1757 and the First Partition of Poland in 1772, which placed Sandomierz in Austria, further reduced its status. As a result Sandomierz lost its role as an administrative capital. In 1809 the city was damaged during fighting between the forces of Austria and the Duchy of Warsaw during the Napoleonic Wars. After 1815 it found itself in the Russian Empire (Congress Poland). At this point it had just 2640 inhabitants. The city again suffered damage during World War I. In 1918 it again became part of independent Poland. In the 1930s, due to the massive public works project known as Central Industrial Area, Sandomierz began to grow quickly. It was projected to become capital of the Sandomierz Voivodeship, and local authorities planned fast development of the city. The Greater Sandomierz was to turn in the 1940s into a city of 120 000. In September 1939, following the German invasion of Poland, the city was occupied by Germany and made part of the General Government. The Jewish population of the city, consisting of about 2,500 people, perished during the Holocaust, mostly in the death camps of Be³¿ec and Treblinka. The city was captured by the Soviet army in August, 1944. No major industrial development took place in Sandomierz, thus preserving it as a charming, small city full of historical monuments among unspoiled landscape. Personally, I don`t find it so attractive as others. All of Poland is great, each city, town, or village, in it's own way.